Improved versions of that proven classic the Custom 875, the EX saxes are the result of decades of painstaking reserch and trials involving some of the world's greatest saxophonists. They feature a smooth response and a deep, refined sound full of rich colors. They also feature a solid feel with quick and nimble action, a wide dynamic range, stunning projection, and an authoritative tone with a beautifully defined total core. You will find that the depth and smoothness of their sound is simply incredible, and you will also find that these horns are very flexible, at home in any kind of music. The size and shape of the key buttons have been changed for a better 'feel', while the new Custom necks enhance tonal resonance and give a quicker, more comfortable response. 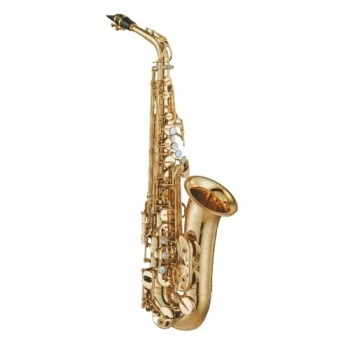 And the saxes feature a two-point bell brace for better efficiency, so you don't have to work as hard to sound great. The smaller C, C#, D & E tonehole diameters provide for better intonation. The new smaller pad cup diameter allows for better response and resonance. The custom handmade V1 neck improves response and flexibility. The position, height, angle and shape of the left-hand pinky keys have all been carefully redesigned to provide extraordinary comfort and quick response.Yamaha saxophone keys are not simply shaped and positioned according to mechanical necessity. The entire system is designed from the player's perspective, with emphasis on comfort, speed, and overall playability. The natural feel of the keys eliminates the need to adapt to an unnatural or uncomfortable key layout.